Basseterre, St. Kitts, February 11, 2019 (S.T.E.P.) — Prime Minister and Minister of People Empowerment, Dr the Hon Timothy Harris, has said that the Skills Training Empowerment Programme (STEP) is uplifting the lives of young people, and has the potential to transform St. Kitts and Nevis. He has asked persons on the programme to take their work seriously. 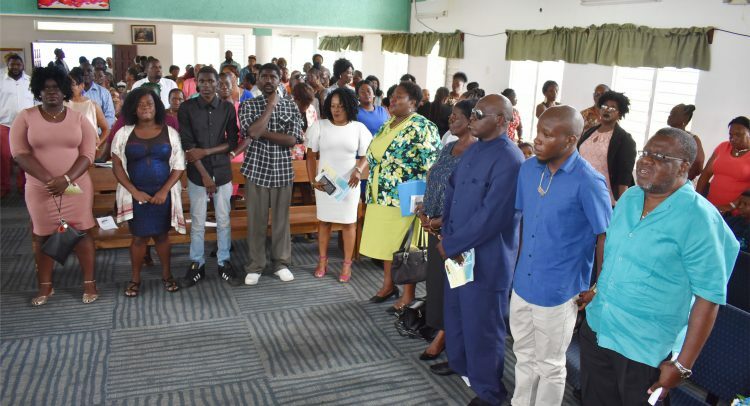 Prime Minister Harris made the remarks on Sunday February 10 at the Mount Carmel Baptist Church in Bourryeau when he officially launched a week of activities to mark STEP’s second anniversary. The celebrations are being observed under the theme ‘Showcasing skills; Empowering people for life’. Prime Minister Harris, who is the Minister with direct responsibility for the STEP, said it was in keeping with a manifesto promise the Team Unity Administration determined that it would revisit and revamp what was then called the People Employment Programme (PEP), to provide a new model of what government felt a successful job training and job creation programme ought to be. As a result of opportunities provided by the STEP in the two years it has been operational, many of the country’s young people are contributing meaningfully to the development of their communities, applying what they have learnt during their time on the STEP. The trainees should be better off for having participated in the STEP and referring to Psalms 18 verse 36 [Thou hast enlarged my steps under me, that my feet did not slip], Dr Harris said he expected all of them to enlarge their capacity for discipline, hard work, teamwork, ingenuity, working together, learning to do, and learning to become the best that they can be. Advising that money was being spent to keep them on the STEP, he implored them to be conscious of that fact each time and ensure that their behaviour and their conduct on the programme would make people want to encourage the government to continue with the programme. The trainees were asked to adhere to the country’s value systems by ensuring a fair day’s work for a fair day’s pay. Present at the worship service included the Minister of Agriculture, Health, National Insurance, Human Settlements et al, the Hon Eugene Hamilton, Permanent Secretary in the Office of the Prime Minister Mr Osbert DeSuza who brought greetings, STEP Director Mr Wendell Wattley who read from the scriptures, STEP’s Quality Assurance Coordinator/Consultant Mr Emile Greene, STEP Office Manager Mrs Agatha Caines, office and field staff, and STEP participants. Monday February 11 will have the launch of a Beautification Competition, appearance on Sugar City Radio by the STEP officials, and broadcast of video feature on STEP on ZIZ TV. Tuesday February 12 will be a day of training for the STEP Field Officers and Supervisors; while STEP officials will appear on ZIZ Radio for the ‘Working for You’ programme on Wednesday February 13. Members of STEP staff from both the St. Kitts, and Nevis offices will on Thursday February 14 take part in a Staff Development Day to be facilitated by Dr Analdo Bailey and Ms Tamu Browne at the OOJJ Conference Centre in West Basseterre. Friday February 15 will be the day to look out for, with the holding of the 2ndAnniversary Edition of STEP Fair at West Independence Square in Basseterre.